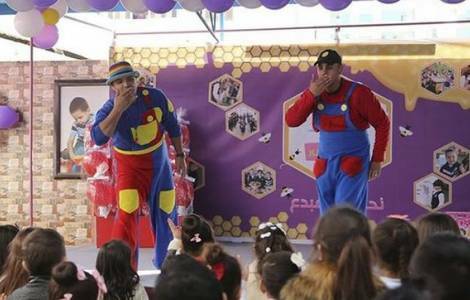 Gaza (Agenzia Fides) – A group of young people in Gaza has decided to take the only Itinerant theatre in Palestine to perform in orphanages, hospitals and day assistance centres, to alleviate the psychological stress and trauma of minors living in the Gaza Strip, suffering a situation of blockade and conflict. The group, known as the Palestinian Entertainment Theatre, comprises twelve young artists who volunteer to spend their time and even money to keep this, the only local itinerant theatre going. It was opened last year. One of the younger audiences favourite pieces consists of a narrator, wearing a red Turkish turban, a Tarbush, a traditional Palestinian head scarf the kufiya, sits in the centre of a circle of children and tells adventure stories . The stories deal with delicate matters regarding the society in which the children live. The children are also given useful information such as never to touch the remains of Israeli missiles and to keep away from the border. These examples of open communication are not frequent in this impoverished enclave. According to the Palestine Central Statists Office (PCBS) there are 14 theatres in Palestine, 11 in West Bank and 3 in Gaza, but none of these are itinerant. One of the difficulties encountered by the organisers is the scarcity of young actresses because Palestinian tradition is against this type of activity for women and this means men have to play women’s roles too.